Washington: The US Federal Reserve kept interest rates unchanged on Wednesday and in a direct reference to its next policy meeting put a December rate hike firmly in play. The central bank also downplayed recent global financial market turmoil and said the US labour market was still healing despite a slower pace of job growth. "In determining whether it will be appropriate to raise the target range at its next meeting, the committee will assess progress - both realized and expected - toward its objectives of maximum employment and 2 percent inflation," the Fed said in a statement after its latest two-day policy meeting. Investors quickly placed bets reflecting a higher chance the U.S. central bank will raise rates in December, with futures contracts implying a 43 percent possibility compared to 34 percent prior to the statement. 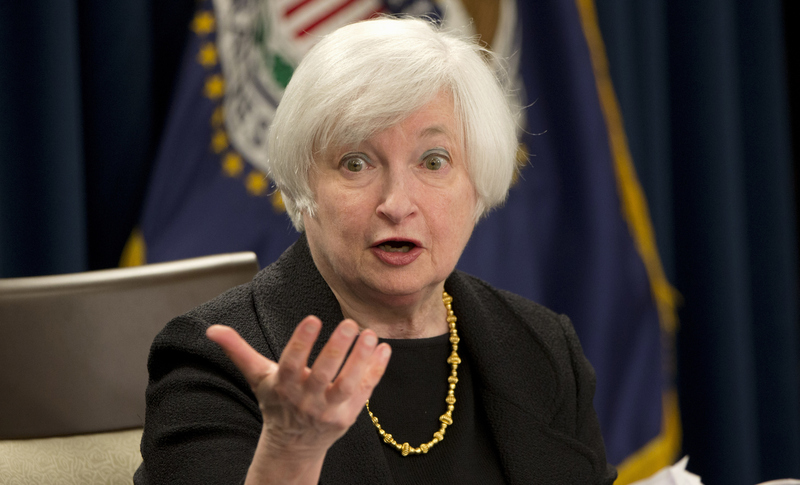 "The Fed is seriously considering a December rate hike," said Harm Bandholz, an economist at UniCredit in New York. Going into the Fed meeting this week, the market had viewed March as the most likely time for the central bank to begin its rates "liftoff," but it now sees a greater chance of that happening in late January. The US dollar rose sharply and yields for US government debt soared in anticipation of higher rates. US stock prices initially fell but regained momentum and closed sharply higher. Michael Feroli, a former Fed economist now at JPMorgan, said the Fed statement was the first since 1999 in which policymakers pointed to a possible rate increase at the next meeting. "By specifically referring to that meeting they are basically testing the waters a bit," said Aneta Markowska, an economist at Societe Generale in New York. She described it as a "subtle attempt" to gently nudge the market in that direction. The Fed has been struggling to convince investors a rate hike was imminent in the wake of data this month that showed US employers slammed the brakes on hiring in August and September. But it countered the scepticism on Wednesday by saying even slower hiring was still enough to get it closer to its goal of maximum employment. Central bank policymakers also pointed to "solid rates" of growth in consumer spending and business investment, while eliminating a reference from their previous statement warning a global economic slowdown could sap US economic strength. Fed Chair Janet Yellen has been saying for much of this year that a rate hike would likely be needed in 2015 to keep the economy from eventually overheating. More recently two Fed governors urged caution over rate hikes while questioning Yellen's views on inflation, though such doubts appeared muted in Wednesday's statement. The Fed now has several important economic readings to parse, including two monthly employment reports, before it makes up its mind on whether to tighten policy at its Dec. 15-16 meeting. It will also get a chance to see how monetary policy easing in Europe, Japan and China plays out in financial markets. Easy money policies abroad push the dollar higher, hurting U.S. exporters and making it harder for the Fed to get inflation back up to its 2 percent target. That may explain why the Fed sought to leave the door open for a rate hike rather than paint the economy as fully ready for a monetary policy tightening. "The Fed has dialled down its anxiety over international developments, but it's best to play it safe," said Brian Jacobsen, a portfolio strategist at Wells Fargo Funds Management in Menomonee Falls, Wisconsin.